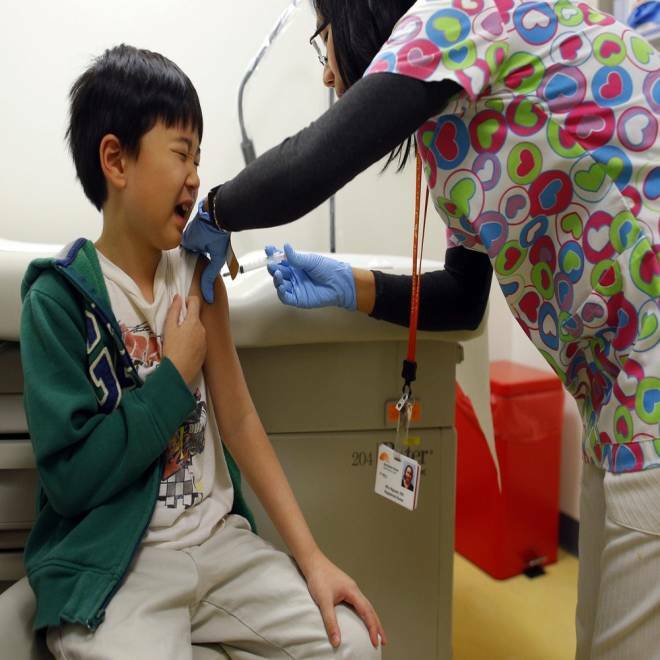 Chihn Ha, 8, gets an influenza vaccine injection from nurse Nho Nguyen, right, during a flu shot clinic at Dorchester House, a health care clinic, in Boston, Mass., in January 2013. The longer-than-average flu season finally appears to be ending, federal officials said on Friday, but it’s not quite done yet. Only six states, mostly in the Northeast, are now reporting widespread influenza. The deaths of another five children were reported this past week, bringing the total for the season to 110, the Centers for Disease Control and Prevention reports. That’s just around the unfortunate average for influenza in any given year, the CDC says, although it varies a lot. The viruses circulating this year were especially hard on people 65 and older and CDC is still trying to work out just how well vaccines may or may not have protected people, especially the elderly, against serious illness and death from flu. So many adults die of flu every year that the CDC can’t keep a precise count, but estimates that it ranges from a low of 3,000 to as many as 49,000. This year was a “moderately severe” flu year, CDC says in a review of the 2012-2013 influenza season. “This season, influenza activity started about 4 weeks early and was intense. Influenza-like-illness rose quickly to well above the baseline of expected activity and remained elevated for 15 consecutive weeks, making this season slightly longer than average,” the agency says in a statement. Half of the patients sick enough to be hospitalized with flu were 65 or older, CDC said. “While hospitalization rates have leveled off, this is the highest proportion of persons 65 and older hospitalized for flu that has been measured since this kind of record-keeping began during the 2005-2006 season,” it said. Sadly, a few were children, and most had not been vaccinated, CDC said. “CDC reported an additional five pediatric deaths this week for a total of 110 to date for the 2012-2013 season. The number of pediatric deaths is likely to climb further as additional deaths are reported,” CDC said. Reports of deaths can take weeks to collate -- some of the five deaths reported this week dated back to December. Experts have done a batch of studies to see how well the flu vaccine worked this year. That varies from year to year and scientists still are not sure why flu vaccination protects more strongly in some years than in others. Flu vaccines have to be formulated freshly each year to protect against the most common circulating strains of virus. This year’s vaccine protected against three strains – one called H3N2, one called H1N1 – a descendant of the H1N1 “swine flu” that emerged in 2009 – and one influenza B strain. Next year’s vaccines are just being formulated now, based on what’s circulating, and some will protect against four strains of flu. “February results showed the 2012-2013 flu vaccine reduced the risk of flu-associated medical visits from influenza A (H3N2) viruses by one half and from influenza B by two-thirds for most of the population,” the CDC said. But it only prevented the risk of severe disease by 27 percent among people 65 and older this year. “It’s possible that some people 65 and older did not mount a good immune response to H3N2 from vaccination,” CDC said.